Packing cubes: What are they and why should I use them to pack? Home » bags and luggage » Packing cubes: What are they and why should I use them to pack? Are you that person that is hopelessly terrible at packing? I used to be that guy. I thought I knew what I was doing. I would carefully roll all of my t-shirts, fold my pants and my button-downs and place them all in my large suitcase. Cut to unpacking at my destination and everything in my bag is a jumbled mess… What happened? Well, it turns out that bags like structure. If you can organize your packing with containers that give structure, you will (1) fit more stuff in your bag and (2) have a much more organized bag that is easier to pull stuff out of. Enter packing cubes. Here is an example: You packed your awesome Helly Hansen rain jacket somewhere in the middle of your bag. You get to you destination and are waiting for a cab to take you to your hotel. However, its super cold and you want to pull JUST your jacket out of your bag. Because you just rolled everything and threw it in the bag, when you pull your jacket out, a metric tonne of underwhere, socks and t-shirts come with, spilling onto the curb… How could you have avoided this embarrassing and mildly infuriating situation? Use packing cubes! 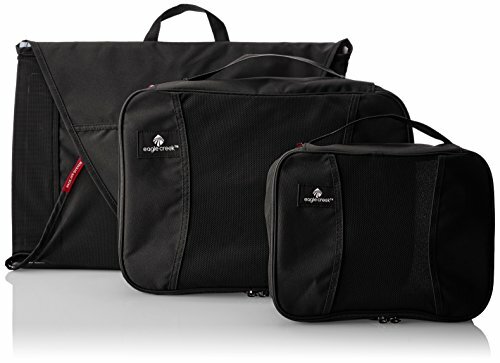 Packing cubes are basically lightweight fabric containers with zippers that you use to actually organized your clothes and other stuff in your luggage. For example, I will generally roll up all of my t-shirts and then place them into a large Eagle Creek packing cube. It fits about 7-8 t-shirts and also does a good job of compressing them a little bit without causing wrinkles. I then take all of my underwear, roll them and then stuff them into a medium Eagle Creek packing cube.Again, you can get about 8 pairs of men’s boxers in one. Now I load these two packing cubes into my bag. If I need I t-shirt, I know exactly where they are. Same with underwear. See where this is going? See how nice packing cubes make your bag? You want these. Next I use the Eagle Creek Pack-it packing folder. This thing is especially awesome for business travelers (or anyone with more formal clothes). Basically it is a flat envelope shaped thing that is used to store dress shirts and pants in a way that reduces wrinkles but also maximizes your packing space. Slide your shirt onto the little packing “board” that comes with the folder and follow the super easy folding directions. Once you have folded each of your shirts and pants, then use the compression wings on the folder to pack all of those snugly in there. Again, its about organization but also compression. I find that I can fit way more clothes in my bag using this method. The best part is using my carry-on luggage with this piece. It fits perfectly on the lid-side compartment, leaving the other side for my normal packing cubes, laundry bag and anything else I need to pack. By using packing cubes I have been able to trim down what used to fit only it a large check luggage to a small domestic carry-on luggage. This has made traveling soooo much better. And now I don’t have issues with stuff falling out of my bag when I open it. I know where everything is, neatly packed into their own packing cube. I would say that anyone that is serious about travel, should absolutely be using packing cubes of some kind. They will change the way you travel. For those of you considering taking the plunge into packing cube heaven, the best way is to pick up the Eagle Creek Starter Set. This contains (1) a large packing cube (2) a medium packing cube and (3) a medium packing folder. So basically you can do exactly what I mention above with this set. 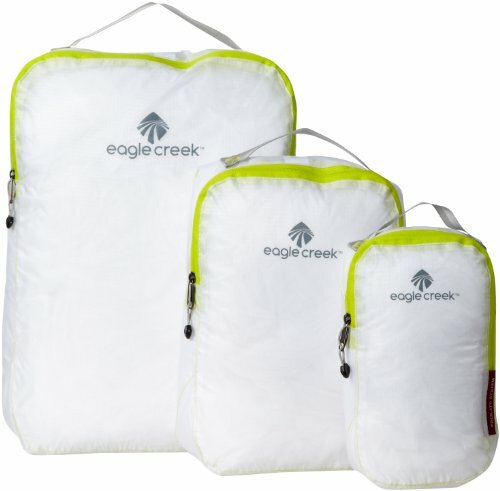 If you’re wanting to pack even lighter, Eagle Creek has introduced their “Specter” packing cube starter set.These do the same job but are made from an even lighter material, sparing valuable weight for your ligthweight travels.